Robert Sloan, Decals and Etchings, 1973 – 1985. 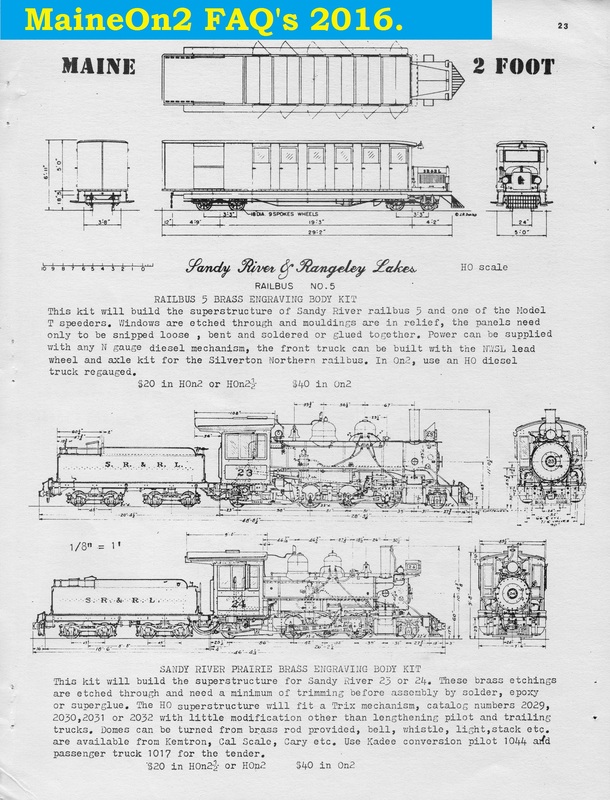 Robert Sloan was a Professor of Geology at the University of Minnesota in Minneapolis who became interested in narrow gauge railways and modelling them in the early 1970’s. He became a well known author on early Colorado three foot lines, and produced decal sheets for these lines. 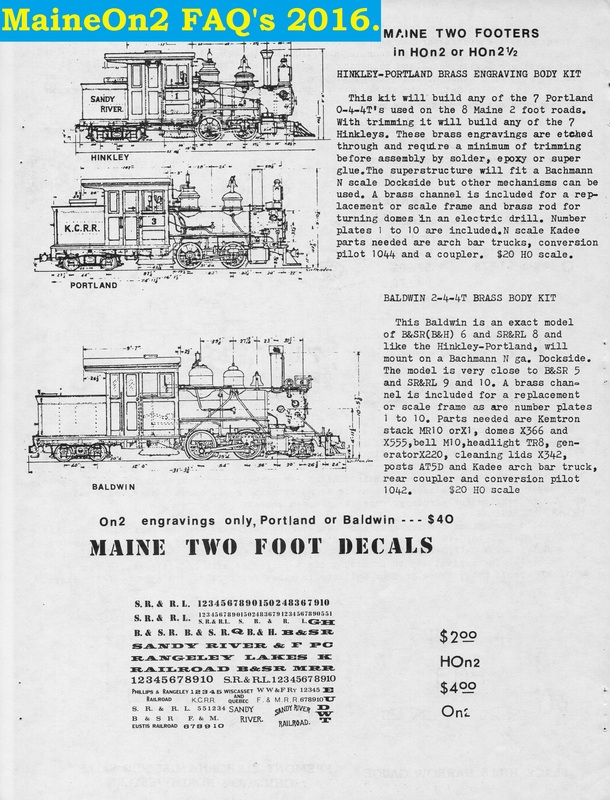 He also produced etched overlays in thin brass (0.010″ is mentioned in the review below) for loco conversions which included some of the Maine Two Footers. 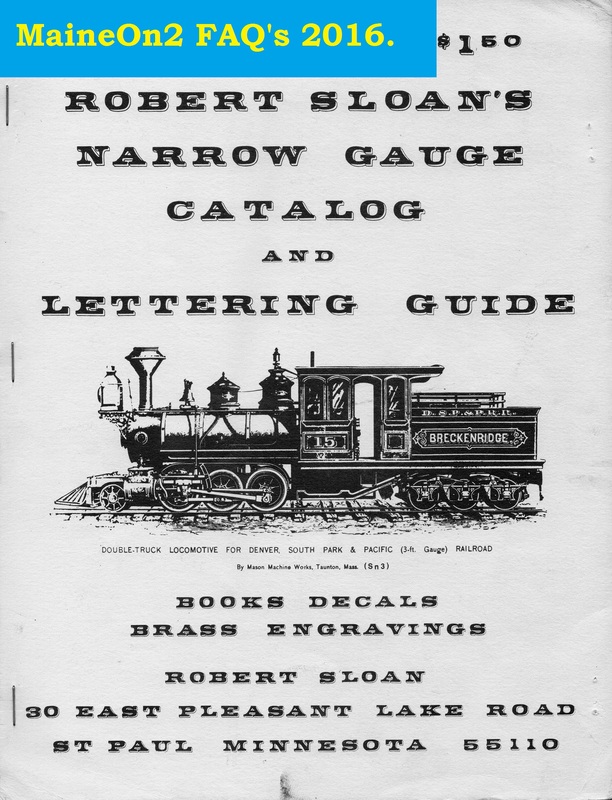 Initially advertising as Sloan Decals, in later adverts he traded as Robert Sloan. He sold the business in 1984/85 to Narrow Gauge Stuff of Hopkins, Minnesota. Just over a year after they announced the acquisition in the May 1985 edition of the Narrow Gauge and Short Lines Gazette magazine, Narrow Gauge Stuff stopped advertising in the Gazette. Click on each picture to view a larger copy. 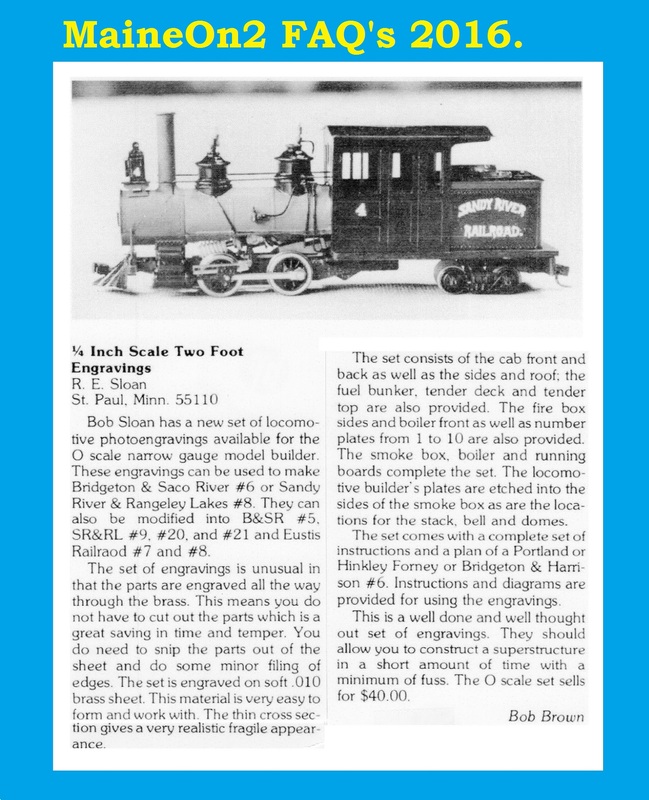 This review appeared in the November 1977 edition of the Narrow Gauge and Short Lines Gazette magazine under the New in Review banner. The catalog, whose pages are shown below, was obtained in 1978 (the second edition), and the text afterwards comes from Robert Sloan’s auto-biography published on his University website. In the winter of 1972, I had run across a photograph of a pair of very fancily lettered refrigerator cars in a book, and desperately wanted to build those cars. But I didn’t want to hand letter them with a 0000 brush or a crow quill pen under a microscope. So I spent many hours deciphering the letters on the photo, Sal even got into the act as we would think of what the letters might be at night in bed, then get the book with the photo and check likely candidates out. (Between us we called it “Retches Barley” since that was one of the words we thought we figured out late at night.) After there were few more changes, I drew the lettering on a car side drawn to scale at ½” to the foot, sent the artwork to the only decal manufacturer I knew of, the Meyercord Company, that had made the prewar model airplane decals I had used. I set it up so that on each sheet there would be a full set of O scale decals, ½ set of S scale, 7½ sets of HO scale and tucked away in otherwise waste space 2 sets of N scale (That, so far as I knew, no one was doing). 800 sheets of decals cost $300 to make, so I took a gamble thinking there might be enough modelers out there to buy them, drew up a set of plans and a set of instructions and sold them as a set. I announced them in Slim Gauge News, in Spring 1973, a modeling and historical Narrow Gauge railroading magazine, where I had started writing articles. My gamble paid off, in the first 30 days all of my investment was returned, when I sold the decal business in 1984, I still had half of the original decals left. This lead to the Sloan Decal Business, which made enough money to cover the costs of my railroading and my professional research. The business went from lettering to specialty brass etchings when I took over the Beaver Creek Line of etched cabs and tender wraps, I wound up making brass etchings to convert existing inexpensive models to Narrow Gauge locomotives in the next larger size, N to HO narrow gauge, HO to S narrow gauge, and Z to N narrow gauge. I added a few white metal castings into the line as well, again for conversions. This made it possible for many to model narrow gauge cheaply. Over the years I wrote some 65 articles for various magazines, organizing them into several books. My model railroad and historical railroad bibliography is almost as large as my professional bibliography, although the papers did not take as long to write. I kept the business until 1984, when it became too time consuming, then sold it, the items are still mostly in production. In the process I made many models including about 20 narrow gauge locomotives and many cars in several different scales, all of them one of a kind. I gave most of them away to friends. I modeled and built locomotives and cars in the following gauges and scales. On3, On2½, Sn3½, Sn3, HO, HOn3, HOn2½, OOn 2’3”, N and Nn3. I never did develop a complete layout, construction and history was more important to me than operation. Click here to view the full autobiography (150+ pages….!) on another browser page. The extract from the Narrow Gauge and Short Lines Gazette magazine appears by kind permission of Bob Brown, Editor and Co-owner.